it has been so snowy & so cold here, i need all the warm drinks to cozy up with! i feel like justin & i have been in hybernation all month long, but it has been a relaxing winter so i can't complain. now let's talk cozy drinks! 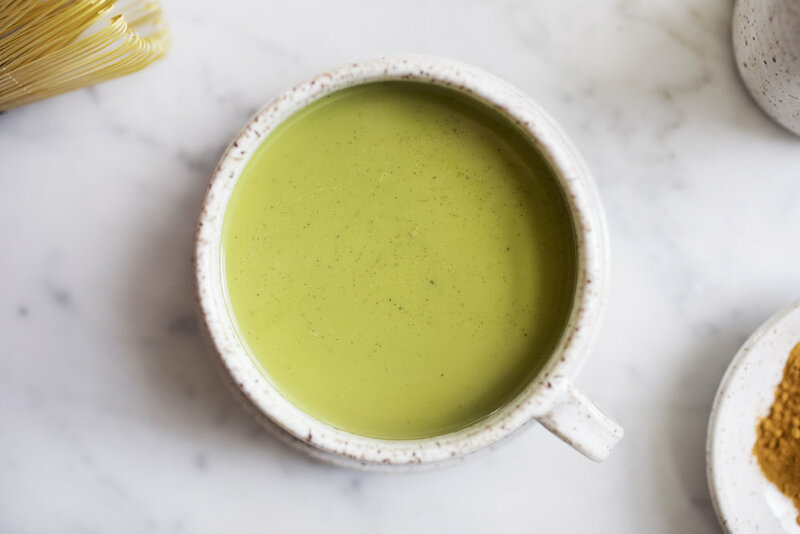 for those of you who love a matcha latte or golden milk, you are going to love this golden matcha milk. 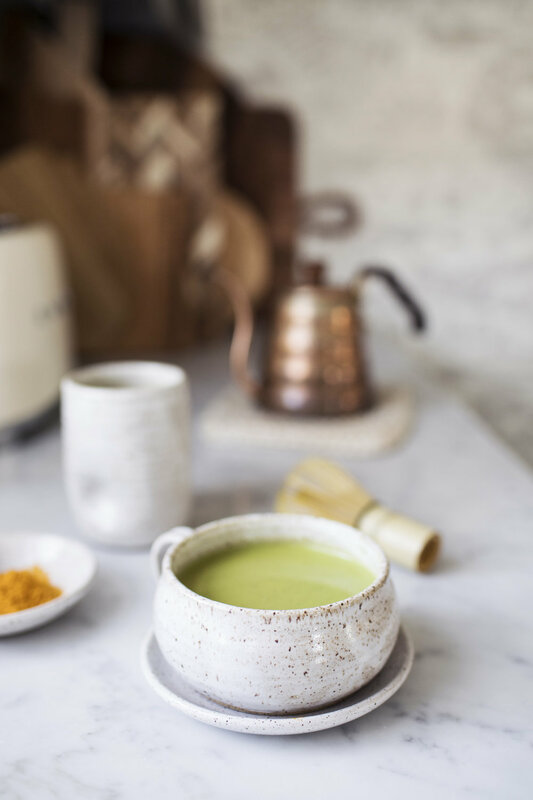 it is the perfect blend of flavours, including matcha, tumeric & ginger which makes this drink so good for you too. i won't get into all the details, but all three ingredients bring amazing health benefits. so enjoy this in the afternoon as you watch the snow fall outside! for the drink itself i use aiya's organic matcha powder & freshly ground tumeric. using a quality matcha powder is very important, as it is the main flavour in this drink. while i recommend a blend of coconut milk & almond milk, use which ever type of milk you prefer! i personally like the creaminess & hint of coconut flavour that the coconut milk provides. although, i am also obsessed with frothing oat milk lately too. so many dairy free milks to choose from! what is your favourite? 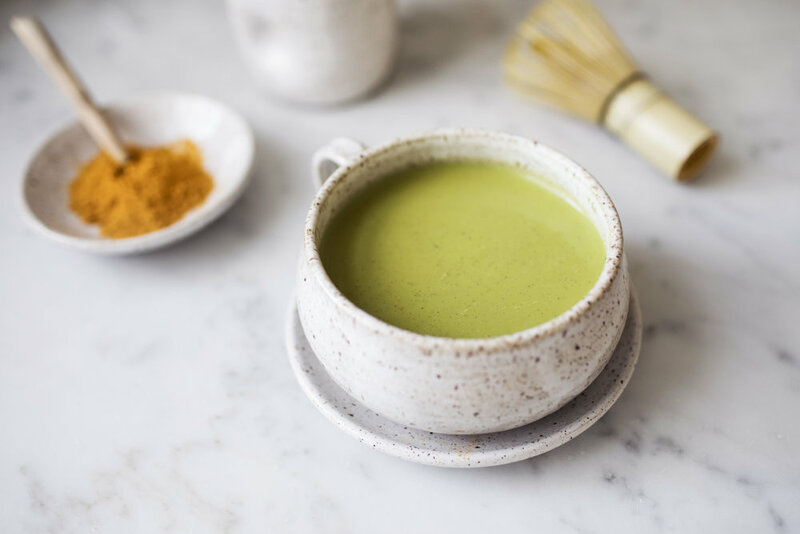 in desired mug add the matcha powder, tumeric & ginger. pour in the water & whisk constantly until well blended. whisk in the honey or maple syrup until mixture is smooth. add the coconut milk & almond milk to desired milk frother. warm & froth to desired consistency. pour into mug & enjoy! this post was created in partnership with aiya america!